We wrapped up our Memorial weekend by grilling at home. We had a fun Sunday with friends attending a St Paul Saints minor league baseball game. Unfortunately we had to leave the game early because it was too darn hot! During the seventh inning stretch we decided we just couldn’t take the heat any longer. Without a breeze, we had had enough. This was the first time I was at a Saints game and have to say it was pretty fun. We finished the weekend with a few house chores and prepared our motor home to sell. Since our kids are grown up and on their own, Chris and I see no reason to keep it. The main purpose we had it was to go on trips and spend time with the kids. The day was really nice so we decided to grill. As Chris was preparing the chicken and a salad, I wandered down to the cellar to find a nice bottle. 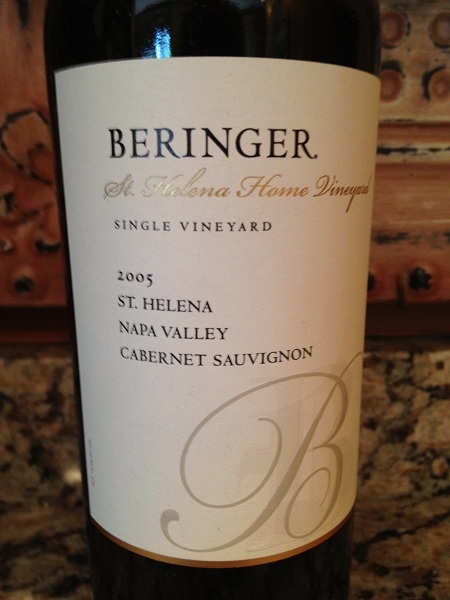 As I was perusing I came across a 2005 Beringer Winery St Helena Home Vineyard Cabernet Sauvignon. If you are not familiar with the location of St Helena, its on the northern side of Napa Valley just south of Calistoga. As I brought up the wine, I was anxious to give it a try. I enjoy the Beringer wines and I love the Reserve Room house on the estate. 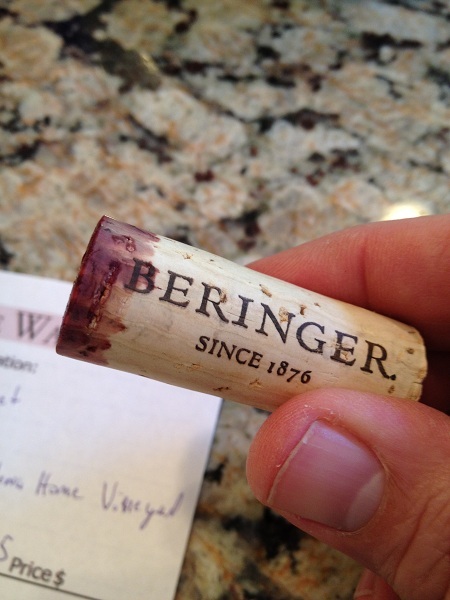 If you are going to Napa Valley Beringer is a “must stop”. They are just south of the Napa Culinary Institute of America just north of Ste Helena. I did not hesitate to pull the foil and pull the cork. I know the cork does not say much, but I like to show the ones that have some caricature and history of the bottle. I immediately noticed the dark garnet color to the Cabernet. 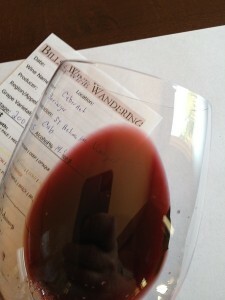 It was not a brilliant garnet you would expect to see in a younger Cabernet Sauvignon. The color depth was medium and very clear. As I smelled the Cabernet the aroma was medium, not intense at all. You could sense it was a little old by some of the earth notes. I could smell Black Cherry fruit. Tasting the Cabernet Sauvignon it was not dry to the taste. It was medium bodied and the tannins were week and soft. The wine was flavorful with a medium finish. I noticed the week tannins throughout my mid palate. Some of the flavors I could taste was Cherry and Liquorice. Both Chris and I enjoyed the bottle and we rated it three glasses.